4. Cervical cancer prevention center, Buddhist Tzu Chi General Hospital. The origin of the majority of epithelial ovarian cancers (EOC) is regarded as extraovarian, with the ovary being the secondary site. The aim of this study was to explore the possible role of ovarian mesenchymal stem cells (OvMSCs) and secreted IL-6 in the development of EOC. OvMSCs were derived from normal ovarian stroma. Cell surface markers and differentiation capability were determined. The effects of IL-6 and conditioned medium of OvMSCs on the malignant phenotype of SKOV3 ovarian cancer cells were tested, and the status of STAT3 and ERK phosphorylation was investigated. OvMSCs had similar surface marker profiles as bone marrow mesenchymal stem cells, i.e., CD44 (+), CD90 (+) and CD45 (-), and was readily inducible to osteogenic, adipogenic and chondrogenic differentiation. OvMSCs secreted an extremely high level (>2500 pg/ml) of IL-6. Treatment of SKOV3 cells with conditioned media from OvMSCs increased cell proliferation, tumor sphere formation and anchorage independent growth, and resulted in activation of STAT3 but not ERK. Coinjection of OvMSCs with SKOV3 cell enhanced tumorigenesis in NOD-SCID mice. All of these behaviors were blocked by IL-6 receptor blocking antibody administered in vitro or in vivo. The OvMSCs alone injected into mice had no tumor growth after 3 months. By secreting high levels of IL-6, OvMSCs enhance the proliferation, sphere and colony formation and tumorigenesis of SKOV3 cells. Keywords: IL-6, proliferation, tumorigenesis, STAT3, SKOV3. Ovarian cancer is the second most common gynecologic malignancy and the most common cause of gynecologic cancer death in developed countries . Kurman et al. divided epithelial ovarian cancer (EOC) into two groups, designated type 1 and 2 . Type 1 tumors include mucinous, endometroid and clear cell carcinomas and low-grade serous carcinoma. They are typically slow growing and confined to the ovary. Type 2 tumors are comprised of high-grade serous (HGSC), high-grade endometrioid and undifferentiated carcinomas as well as malignant mixed mesodermal tumors. Clinically, they are aggressive and exhibit genomic instability with frequent p53 mutations [3-5]. Mounting evidence has demonstrated that both type I and type II ovarian tumors develop outside the ovary and involve the ovary as a secondary site [6, 7]. Mesenchymal stem cells (MSCs) are stromal cells with the capacity to self-renew and differentiate into fibroblast, adipocyte and osteoblast lineages [8-11]. MSCs also possess strong modulation effects of tumor development . For instance, bone marrow MSCs are recruited and incorporated into tumor microenvironments to promote tumor growth [13, 14]. Human MSCs are capable of creating an immuno-suppressive environment and promoting breast cancer growth in mice . Previously, MecLean et al. demonstrated that MSCs derived from ovarian cancer tissue could promote tumor growth via altered BMP production . However, the role of normal ovarian MSCs on ovarian cancer cells when they first encounter the ovarian microenvironment is unknown. MSCs can secrete cytokines and chemokines that mediate tumor cell growth and metastasis [13, 17-19]. Among them, interleukin-6 (IL-6) is an inflammatory cytokine that plays a role in the progression of a variety of malignancies, including ovarian cancer [18, 20, 21]. Patients with ovarian cancer have higher levels of IL-6 in the serum and peritoneal fluid [22-27]. Further, high IL-6 levels in the serum in ovarian cancer patients are associated with poor prognosis [23, 25-27]. IL-6 can also stimulate ovarian cancer cell growth through a paracrine mechanism . Given that the ovary can be a secondary site of the development of EOC, it would be interesting to know how the ovarian microenvironment influences the developing cancer cells. This study derived MSCs from normal human ovary (OvMSCs) and demonstrated their role in promoting tumorigenesis of ovarian cancer cells, likely through secretion of an extremely high level of IL-6. After approval from the Research Ethics Committee of the Buddhist Tzu Chi General Hospital, human ovarian tissue was isolated from three young female patients. All the participants provided written informed consent to participate in the study. We obtained informed consent from guardians on behalf of the participants under 20 years of age. The first case was a 13-year-old patient undergoing staging surgery for a stage 1C malignant tumor of the contralateral ovary. There other two cases (17 and 25 years old, respectively) underwent ovarian surgery for serous cystadenoma and teratoma. All three of the collected ovaries were in the follicular phase and their volumes were around 1 × 1 × 1 cm3. For primary culture of OvMSCs, the harvested ovarian stromal tissues, without epithelial parts and follicles, were cut into small pieces and digested with 0.1 mg/ml collagenase Ia (Sigma, St. Louis, MO, USA) at 37oC for 60 min. After enzyme digestion, the resulting cells were collected and cultured with DMEM-low glucose media (LG, Gibco, Grand Island, NY, USA) with 10% FBS (Biological Industries, Kibbutz, Israel). The supernatant and debris in the culture dish were removed on the second day of culture. The resulting OvMSCs culture was denoted as passage 0. Further passages of cultures were performed using 2.5% trypsin/0.23 mM EDTA (Gibco, Grand Island, NY, USA). Mesenchyme-stromal cells were derived from fallopian tubes (FTMSC) that were procured from surgery. The collected fallopian tubes were cultured with DMEM-LG media supplemented with 5% FBS, L-ascorbic acid-2-phosphate, n-acetylcysteine (NAC) and 1% penicillin/streptomycin (P/S). Follicular fluid (FF) was collected from hyper-stimulated mature follicles from a female receiving in vitro fertilization. The aspirated FF was centrifuged at 350 xg for 5 min to collect the supernatant. After centrifugation at 450 xg for 1.5 min, the inter-phase cells were collected to enrich for follicular cells. The cells were then cultured with DMEM/F12 media (Corning, NY, USA) supplemented with 10% FBS and 1% P/S. Immortalized fallopian tube epithelial cells (FE25) and FE25 cells transformed with K-RAS oncogene (FERAS) were cultured with MCDB105 (Sigma, St Louis, MO, USA) +M199 (Gibco) (1:1, v/v) supplemented with 10% FBS and 1% P/S, as described previously . RL95-2 endometrial cancer cells were cultured with DMEM/F12 media supplemented with 10% FBS, 1% P/S and 5 μg insulin. SKOV3 ovarian cancer cells were cultured with RPMI 1640 media (Caisson Lab, North Logan, UT, USA) supplemented with 10% FBS and 1% P/S, while HCT116 colon cancer cells were cultured with DMEM-high glucose media (Gibco) supplemented by 10% FBS and 1% P/S. Surface molecules of OvMSCs cultured on the 3rd or 4th passages were characterized by flow cytometry. The cells were detached with 2 mM EDTA in PBS, washed with PBS containing 2% bovine serum albumin (BSA) and 0.1% sodium azide (Sigma, St Louis, MO, USA) and incubated with the appropriate antibodies (i.e., CD34, CD44, CD45, CD73, CD90 and CD105, HLA-ABC or DR) conjugated with fluorescein isothiocyanate (FITC) or phycoerythrin (PE) (BD, PharMingen, Franklin Lakes, NJ, USA). The cells were analyzed using a Becton Dickinson flow cytometer (Becton Dickinson, San Jose, CA, USA). The OvMSCs were seeded in a 12-well plate at a density of 5 × 104 cells per well with adipogenic medium (DMEM media supplemented with 10% fetal bovine serum (FBS), 1 μmol/L dexamethasone (Sigma), 5 μg/mL insulin (Sigma), 0.5 mmol/L isobutylmethylxanthine (Sigma) and 60 μmol/L indomethacin (Sigma)). These OvMSCs were then grown for 7 days, with a media change every 3 days, and stained with Oil Red (Sigma, St Louis, MO, USA). OvMSCs were seeded in a 12-well plate at a density of 1 × 104 cells per well and grown with osteogenic medium (DMEM media supplemented with 10% FBS, 0.1 μmol/L dexamethasone (Sigma), 10 mmol/L β-glycerol phosphate (Sigma) and 50 μmol/L ascorbate (Sigma)) that was changed every three days. The cells were grown for 21 days and then stained with Alizarin Red (Sigma, St Louis, MO, USA). The OvMSCs were seeded in a 12-well plate at a density of 1 × 105 cells/cm2 per well and grown in chondrogenic media consisting of DMEM media, 10% FBS, 10 ng/ml TGF-β1, 50 μg/ml ascorbic acid-2-phospate and 6.25 μg/ml of insulin. The media was changed every three days. The cells were incubated with the chondrogenic media at 37oC with 5% CO2 for 21 days. After being fixed in paraformaldehyde, the cells were mounted on slides and stained using standard Alcian Blue protocols (Fluka, Sigma, ChemieGmbh, Buchs, Germany). Total RNA was isolated using Trizol reagent (Invitrogen, Grand Island, NY, USA), and cDNA was synthesized by reverse transcription from 1 μg of total RNA using Superscript II reverse transcriptase in the presence of random primers. Polymerase Chain Reaction (PCR) was conducted using 2 μl of the RT reaction mix with 10 μM of each primer, 0.5 μl of Taq polymerase, 1× reaction buffer and 200 μM dNTPs (Perkin-Elmer, Waltham, MA, USA) in a 50 μl PCR reaction volume. The PCR amplification was performed using a thermal cycler (ABI). For quantitative RT-PCR analysis, FastStart universal SYBR green master (ROX, Roche, USA) gene expression assays were used in an ABI Step One Plus system (Applied Biosystems), with GAPDH used as an internal control. Primers for amplifying each individual gene were as follows: 5′-AGC CTC ATG AAG AGC CTT CCA-3′, 5′- TCC GGA AGA AAC CCT TGC A-3′ for Peroxisome proliferator-activated receptor (PPAR-γ, adipogenesis); 5′- AGG AGG AGG CAG AGC ACA-3′, 5′- CTG GTA TGG CAC AGG TGA TG-3′ for alkaline phosphatase (ALPL, osteogenesis); 5'-ACA GCT GGG GAC ATT AGT GG-3', 5'-GTG GAA TGC AGA GGT GGT TT-3' for Aggrecan (ACAN, chondrogenesis); 5′-GAGAGGTCTTCCTGGCAAAG-3′, 5′-AAGTCCCTGGAAGCCAGAT-3′ for type II collagen (COL2A1, chondrogenesis); 5′- GGC AGC AGC AAG CAT TCC T-3′, 5′- GCC CAA CAC CCC CAG TCA-3′ for GAPDH. The OvMSCs were seeded in a 10-cm plate and then cultured in DMEM-low glucose with 10% FBS for 48 h. After 48 h, the medium was replaced with 8 ml of fresh DMEM media with 0.2% BSA, but lacking serum, and the cells were cultured for another 48 h. The culture medium was then collected, filtered and stored at -80°C. Conditioned medium (CM) was collected from 5 x 105 cells grown in 10 ml of medium without serum for 48 hours. The collected CM was then analyzed for IL-6 by ELISA kits (Quantikine®; R&D, Minneapolis, MN, USA). Briefly, wash buffer, substrate buffer and human IL-6 standard were prepared to different concentrations (3.13-100 pg/ml). Assay Diluent RD1W (100 μl) was then added to each well. Standard, sample or control (100 μl) was also added to each well. After 2 hours of incubation at room temperature, the cells were rinsed with wash buffer four times. IL-6 conjugate (200 μl) was added to each well, which was then incubated for 2 h at room temperature. After four washes, 200 μl of substrate solution were added and the wells were incubated for 20 min at room temperature. Stop solution (20 μl) was added to each well, and the wells were sent for optical density detection at 540-570 nm. A standard curve was created for calculating the human IL-6 concentration. Proliferation assays were conducted in 96-well plates, starting with a cell density of 2000 cells/cm2 with or without the CM of OvMSCs (100% CM) or 1500 ng/ml of anti-IL-6 receptor (IL6R) (R & D Systems, Inc., Minneapolis, MN, USA). The conditioned medium was changed every 3 days. The cells were harvested at baseline and on days 2 and 3 and then subjected to XTT assay (Roche, Mannheim, Germany) following the manufacturer's protocol. The control group of SKOV3 cells were cultured in DMEM media supplemented with 10% FBS with or without adding IL-6 (1 ng or 3 ng, PeproTech, Rocky Hill, NJ, USA) and IL-6R antibody (1500 ng/ml, R & D Systems, Inc., Minneapolis, MN, USA). To evaluate tumor sphere formation, tumor cells (SKOV3) were cultured with or without CM (2 ml 100% CM) from OvMSCs, and with or without anti-IL-6R antibody (1500 ng/ml, R & D Systems, Inc., Minneapolis, MN, USA). For tumor spheroid culture, monolayer cultured tumor cells were re-suspended with trypsin, and 1×104 cells were seeded in Ultra-Low Attachment Surface micro-plates (Corning, Corning Inc., Corning, NY, USA). The control group of SKOV3 cells were cultured in DMEM/F12 media supplemented with 10 ng/ml bFGF, 20 ng/ml EGF, 5 μg/ml insulin and 0.4% BSA, with or without IL-6 (3ng) or IL-6R antibody (1500 ng/ml). The soft agar assay for anchorage-independent growth was carried out on 5×105 SKOV3 cells in OvMSC conditioned medium (4 ml) supplemented with 0.35% agarose and layered on a 5 ml base of 0.7% agarose. Each experiment was conducted in triplicate. After 40 days, the cells were stained with 0.8 mM crystal violet (Sigma-Aldrich, St. Louis, MO, USA). The control group of SKOV3 cells were cultured in RPMI 1640 media supplemented with 10% FBS with or without added IL-6 (3ng, PeproTech) or anti-IL-6R antibody (1500 ng/ml). The procedures for animal experiments were carried out in adherence to the National Institutes Health Guide for the Care and Use of Laboratory Animals approved by The Animal Research and Care Committee of the Buddhist Tzu Chi General Hospital. Non-obese, diabetic-severe combined immune deficiency (NOD-SCID) (strain name: NOD.CB17-Prkdcscid/JTcu) mice were obtained from Tzu Chi University. In tumor growth and inhibition experiments, tumor formation of SKOV3 (1 × 105) only (n=6) or SKOV3 (1×105) +OvMSCs (3 × 105) in 200 μl PBS in five-week-old female NOD-SCID mice with (n=6) or without (n=6) anti-IL-6R antibody was compared. Anti-IL-6R antibody (1mg/kg) was injected intraperitoneally every 6 days, starting 6 days after tumor cell injection. After 6 weeks, all mice were sacrificed and the tumors were excised and weighed. OvMSCs (3 × 105) in 200 μl PBS injected into five-week-old female NOD-SCID mice was tested for tumorigenecity (n=2). For histological examination, xenograft tumor tissues were fixed in 4% paraformaldehyde. Four-μm-thick paraffin-embedded tumor sections were cut and stained with hematoxylin and eosin. Tumor tissue was assessed at x200 total magnification. Cell density, nuclear polymorphism, and mitotic figures were determined. Cells were lysed in protein lysis buffer (Sigma) for protein extraction. The proteins were separated by SDS polyacrylamide gel electrophoresis (SDS-PAGE). Specific antibodies against STAT, phospho-STAT3 (p-STAT3), ERK, p-ERK and actin were used (Abcam, Cambridge, UK). The signals were visualized by enhanced chemiluminescence. Recombinant human IL-6 protein (3 ng/ml) was added into the culture of SKOV3 cells with or without pre-treatment with IL-6R antibody (1500 ng/ml,). The results were expressed as mean ± SD. Raw data were analyzed using two-way repeated measure ANOVA, Kruskal-Wallis, Mann-Whitney and unpaired student T tests, as appropriate. Statistical significance was set at p<0.05. The OvMSCs were positive for CD44, CD73, CD90, CD105 and HLA-ABC and negative for CD34, CD45 and HLA-DR (Fig. 1A). To determine the differentiation potential of OvMSCs, cells were cultured with induction media. After three weeks, the formation of adipocytes, osteocytes and chondrocytes were demonstrated by Oil red, Alizarin red, and Alcian blue, respectively (Fig. 1B). Expressions of lineage specific genes of adipocyte (PPAR-γ), osteocyte (APAL) and chondrocyte (ACAN, COL2A1) were analyzed by qRT-PCR (Fig. 1C). Levels of IL-6 in conditioned medium (CM) of OvMSCs was determined by ELISA, and showed an extremely high level (2511.9 ± 50 pg/ml). Compared to CM of primary cells from the adjacent organs, it was 2.5-times higher than MSC-like cells derived from the fallopian tube (FTMSC) and 8.3-times higher than that of an immortalized fallopian tube fimbria epithelial cell (FE25). Compared to cancer cells, it was 12.5-fold higher than that of ovarian cancer cells SKOV3 and transformed fallopian tube fimbria epithelial cell (FERAS), and 25-fold higher than levels in mature human follicular fluid (Fig. 2). Interestingly, tumor cell lines of non-tubo-ovarian regions, such as endometrial cancer cells RL95-2 and colon cancer cells HCT116, did not express any IL-6 (Fig. 2). To investigate whether OvMSCs could affect the tumorigenic activity of ovarian cancer cells, SKOV3 cells alone or with OvMSC (in 1:3 ratio) were injected into the two flanks of NOD-SCID mice. A significantly larger tumor (p=0.037) was noted on the co-injected side compared to the SKOV3-only side (Fig. 3). 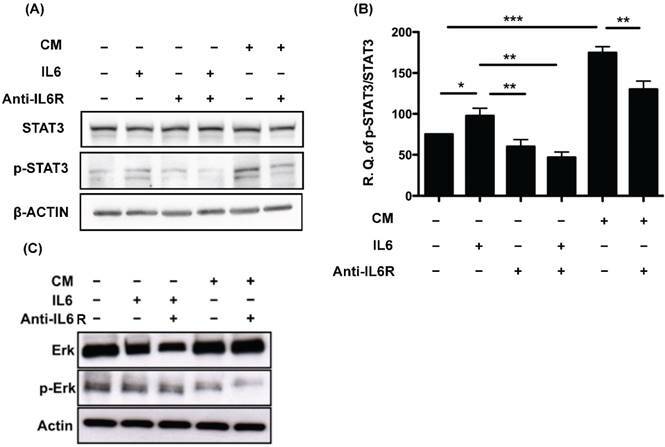 This phenomenon could be block by IL-6R antibody injection (p<0.01, Fig. 3). The group with OvMSCs alone had no tumor growth after 3 months (n=2). To further investigate the transformation role of OvMSCs, SKOV3 cells were treated with CM of OvMSCs. The addition of OvMSCs CM significantly increased the proliferation (p<0.001), sphere formation (p<0.01) and AIG activity (p<0.001) of SKOV3 (Fig. 4). All three of these activities were diminished by IL-6R antibody (p<0.01 for sphere formation and p<0.001 for proliferation and AIG). Furthermore, IL-6 added in the SKOV3 CM could also increase proliferation (p<0.01), sphere formation (p<0.05) and AIG colonies (p<0.01). Dysregulation of IL-6 and the downstream JAK/STAT3 signaling pathway is closely related to the development of ovarian cancer [29, 30]. We investigated the downstream signals of IL-6 and its receptor IL-6R. Phosphorylation of STAT3 was detected 24 h after treating SKOV3 cells with IL-6 (p<0.05). This phosphorylation could be blocked by treatment with IL6R antibody (p<0.01) (Fig. 5A). Similarly, phosphorylated STAT3 was also detected after the addition of the CM of OvMSCs (P<0.001), and could be diminished by anti-IL-6R antibodies (p<0.01) (Fig. 5A, B). This suggested that the effect of OvMSCs secreted IL-6 on SKOV3 is through the JAK-STAT3 pathway. 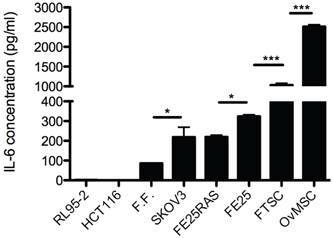 Nevertheless, the same treatments did not increase levels of phosphorylated Erk, the other signaling protein known to be activated by IL-6 in ovarian cancer cells  (Fig. 5C). Cell surface marker profile and differentiation of ovarian mesenchymal stem cells (OvMSCs). 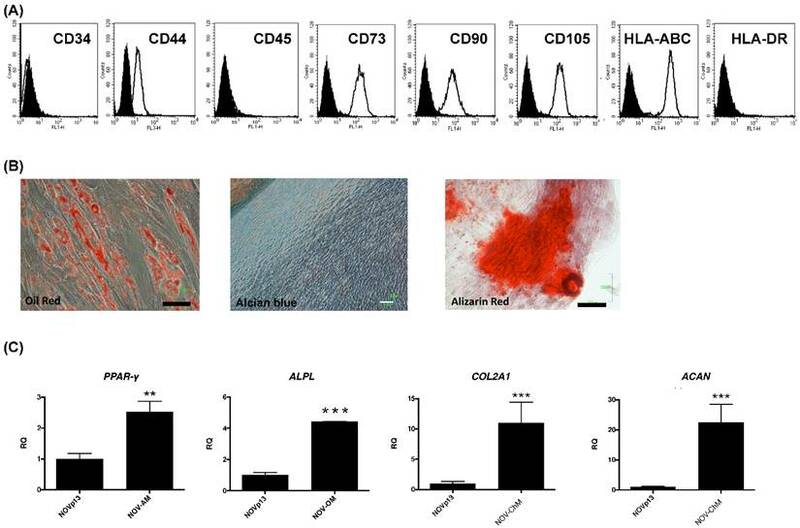 (A) In flow cytometry, OvMSCs were positive for CD44, CD73, CD90, CD105 and HLA-ABC, and negative for CD34, CD45 and HLA-DR. (B) OvMSCs were induced for differentiation with appropriate culture medium, as indicated. Induction of adipogenesis (A), osteogenesis (O), and chondrogenesis (C) were demonstrated by staining with Oil Red, Alizarin Red and Alcian blue, respectively, and by the expressions of mRNA of PPARγ, alkaline phosphotase (ALPL), aggrecan (ACAN) and type 2 collagen (COL2A1) (C), respectively, **p<0.01, ***p<0.001. Enzyme-linked immuno-sorbent assay (ELISA) analysis of interleukin-6 (IL-6) concentration in conditioned medium (CM) of various cell lines, *p<0.05, ***p<0.001. RL95-2: endometrial cancer, HCT116: colon cancer, FF: follicular fluid, SKOV3: ovarian cancer, FE25RAS, FE25: immortalized and cancerous fallopian tube epithelial cells, FTSC: fallopian tube mesenchymal stem cells, OvMSC: ovarian mesenchymal stem cell. In vivo tumor growth of cancer cells with or without OvMSCs (n=6). SKOV3 cells alone or with OvMSCs were subcutaneously injected to NOD-SCID mice. After 35 days, the mice were sacrificed and the tumors collected. Tumor weight was measured. (A) A significantly larger tumor (**p<0.01) was noted on the co-injected side compared to the SKOV3 only side. IL-6R antibody intraperitoneal injection could inhibit tumor growth after 6 weeks (**p<0.01). Representative tumor tissues were obtained at day 35 after inoculation into NOD-SCID mice in the upper panel. (B) Hematoxylin & Eosin staining of representative section of xenografts with or without OvMSCs. Scale bar: 100 μm. Transformation phenotype of ovarian cancer cells (SKOV3) treated with OvMSCs conditioned medium (CM) and/or anti-IL-6 antibody. (A) Proliferation of ovarian cancer cells after treatment with OvMSC CM, IL-6 and/or anti-IL-6 neutralizing antibody. (B) Comparison of cell proliferation on day 3. (C) Sphere formation assays of ovarian cancer cells with the same treatment as above. (D) Anchorage independent growth (AIG) of ovarian cancer cells with the same treatment as in (A). *p<0.05, **p<0.01, ***p<0.001. Activation of STAT3 in response to IL-6 and conditioned medium (CM) of OvMSCs. Expression of activated and total STAT3 (A) or ERK (C) pre- and post-IL-6, IL-6 receptor antibody (IL-6R Ab) and CM treatment in SKOV3 cell lines. SKOV3 cell lysates were treated with 3ng IL-6, 1500ng/ml anti-IL-6R Ab and OvMSC CM for 24 h and Western blot analysis was performed. Experiments were performed three times and blots are representative of one independent experiment. (B) Graphs are represented as the sum of the mean density of p-STAT3/STAT3 normalized against actin from three independent experiments. *p<0.05, **p<0.01, ***p<0.001. MSCs in tumor stroma play an important role in cancer development due to their ability to self-renew and differentiate into various cell lineages . In this study, we were interested in the role of ovarian MSCs on the development of ovarian cancer. Three OvMSCs were developed that, like other MSCs, exhibited surface markers common to MSCs and showed the potential to differentiate into osteogenic, adipogenic and chondrogenic cells. Like other MSCs , no tumorigenesis was noted (n=2, data not shown). Different origins of MSCs could have both enhancing and inhibiting effects on different tumors. Bone marrow MSCs (BMSCs) and adipose stem cells (ASCs) have previously been reported to enhance xenograft tumor growth (breast cancer, lung cancer and malignant glioma cells) through MSCs secreted CCL5 [13, 32]. 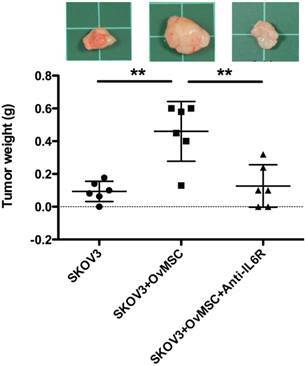 In contrast, dermis MSCs (Z3 hMSCs) inhibited xenograft breast and hepatoma cells growth through MSC secreted DKK1 [33, 34]. Nevertheless, ASCs also had inhibitory effects on hematopoietic cancer cells through ASCs secreted DKK1 . Moreover, mouse BMSCs can also inhibit isograft hepatoma and lymphoma cells . This study, echoing previous studies in cancer stromal MSC, BMSC and commercialized mesenchymal cells [13, 17, 32], indicates that MSCs have tumor enhancing effects. This the first study on the effect of MSCs derived from human ovaries on ovarian tumor cells. Furthermore, it is the first discovery that OvMSC promotes the proliferation and tumorigenesis of ovarian cancer cells. Touboul et al. found that amniotic MSCs can enhance the infiltration and invasion of ovarian cancer cells in a 3D amniotic membrane system. 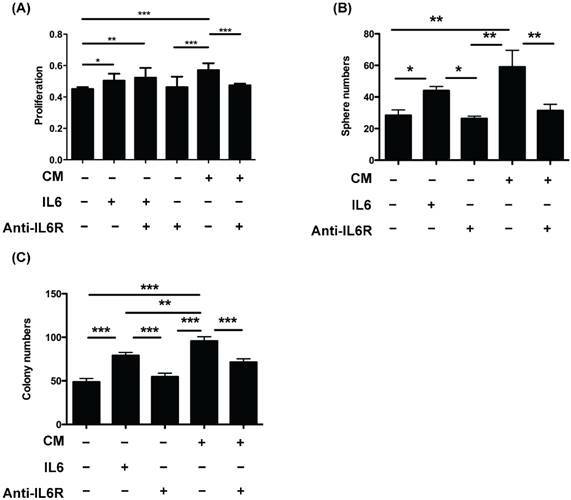 An increase in IL-6 expression was noted in this co-culture system, and an anti-IL-6 receptor antibody inhibited the infiltration of cancer cells into the membrane . However, in reality, ovarian cancer cells will never encounter amniotic MSCs. Instead, OvMSCs are enriched in ovulation, where the wound and repairing process takes place. Given that the vast majority of epithelial ovarian cancers (EOC) originate outside the ovary , we were especially interested in the MSCs of the normal ovary, which represents the microenvironment where the precursor cells first get to their destiny. This study posits two hypotheses of extraovarian origin of both type 1 and type 2 EOCs . The first is that retrograde menstruation brought type 1 ovarian cancer precursors to the ovary. The cells are then engrafted by ovarian surface epithelium and get implanted into the ovary. The second is that type 2 EOCs (or HGSC) originate from the fallopian tube fimbria. The fimbrial carcinoma cells take advantage of the oocyte pick-up process and get implanted in the ovary. Both hypothesis allow for the encounter of OvMSCs. We found an extremely high level of IL-6 secreted in the CM of OvMSCs (Fig. 2). The levels were above 2500 pg/ml in all three OvMSC lines derived from different women. This level was 2.5-fold higher than the MSCs derived from the orthotopic origin of type 2 EOC in the fallopian tube fimbria. This suggests that there is a more supportive microenvironment in the ovarian stroma than the primary site of fallopian tube. In contrast to the mesenchymal cells, normal or transformed epithelial cells of the fallopian tube, primarily cultured follicular cells of the mature follicle and various cancer cell lines expressed very low levels of IL-6. MSCs are known to express large amounts of IL-6. Compared to previously reported IL-6 levels in MSCs derived from adipose tissue (~100 pg/ml) and bone marrow (600-700 pg/ml) [38-40], the level in OvMSC is the highest (>2500 pg/ml) [38-40]. IL-6 is important for fetal ovary germ cell development , but does not play a significant role in hormone production and ovulation [42, 43]. IL-6 is secreted by granulosa cells , and an elevated follicular fluid IL-6 concentration has been noted prior to and during ovulation . In this study, IL-6 levels in follicular fluid and follicular cells or luteinized granulosa cells are much lower than those of OvMSCs . A previous study of IL-6 in the CM of granulosa cells showed a level of approximately 100 pg/ml , which is also much lower than IL-6 in OvMSCs. The reason behind the particularly high levels of IL-6 in ovarian MSCs is unknown. The ovary is unique in its physiology as a hormone-producing and ovulating organ. It is known that intensive inflammation and high levels of ROS are indispensible for ovulation . After ovulation, there is also an inflammation reaction leading to wound healing and repair. All of these may be responsible for the high level of IL-6 in the ovarian stroma. IL-6 secreted from OvMSCs readily increases the proliferation, sphere formation and anchorage-independent growth of SKOV3 ovarian cancer cells (Fig. 4). When co-injected in immuno-compromised mice, OvMSCs enhance the tumorigenesis of SKOV3 cells. The findings are consistent with those of a recent report showing that bone marrow MSCs promote the growth of colon cancer through the secretion of IL-6 . The importance of IL-6 in the advancement of ovarian cancer is also supported by high levels of IL-6 in serum specimens of patients with ovarian cancer [24, 26]. Furthermore, this study also showed that the tumorigenesis enhancing activity of IL-6 and of the CM of OvMSCs is mediated by JAK2/STAT3 activation. The importance of the IL-6-JAK2/STAT3 signaling pathway in cancer invasion and initiation has been demonstrated in virtually all malignancies . In agreement with this result, an in vivo tumor enhancing effect of BMSCs on colon cancer has also reported to be mediated via the activation of JAK2 and STAT3 by MSC-secreted IL-6 . In conclusion, by isolating MSCs from primary human ovarian tissues, this study demonstrated that high levels of IL-6 secreted by OvMSCs may be an important tumorigenesis enhancing signal, and supports a therapeutic trial of anti-IL-6 use in treatment of ovarian carcinoma . Hsian-Lan Chou and Wei-Ting Hung were appreciated for their technical support in this study. This work was supported by the Intramural research project of Buddhist Tzu Chi General Hospital (TCRD 103-27) given to DCD and HWL. This work was supported by the Intramural research project of Buddhist Tzu Chi General Hospital (TCRD 103-27). Conceived and designed the experiments: DCD, TYC. Performed the experiments: DCD. Analyzed the data: DCD, HWL, TYC. Wrote the paper: DCD, TYC. Ethics was approved from the Research Ethics Committee of the Buddhist Tzu Chi General Hospital (IRB 101-09). All the participants provided written informed consent to participate in the study. The procedures for animal experiments were carried out in adherence to the National Institutes Health Guide for the Care and Use of Laboratory Animals approved by The Animal Research and Care Committee of the Buddhist Tzu Chi General Hospital. Corresponding author: Tang-Yuan Chu, M.D., Ph.D. Department of Obstetrics and Gynecology, Buddhist Tzu Chi General Hospital, No. 707, Chung-Yang Rd., Sec. 3, Hualien 970, Taiwan. Tel: +886-3-856-1825 Fax: +886-3-857-7161 Email: hidrchucom.